The state space approach, introduced by Kalman (1960) and Zadeh and Desoer (1963), distinguishes modern systems and control theory (Cames, 1988; Hannan & Deistler, 1988; Polderman & Willems, 1998) from the classical theory. Its application field, starting from space technology in the 1960s, has extended considerably since (Shumway & Stoffer, 2000). The state space model covers an extremely general class of dynamic models. In fact, all nonanticipative models (models with no causal arrows heading backward in time) can be represented in state space form. For example, both the Box-Jenkins ARMA model and the extended ARMAX model, which adds exogenous or input variables to the ARMA model, are easily formulated as special cases of the state space model (Cames, 1988; Deistler, 1985; Ljung, 1985). 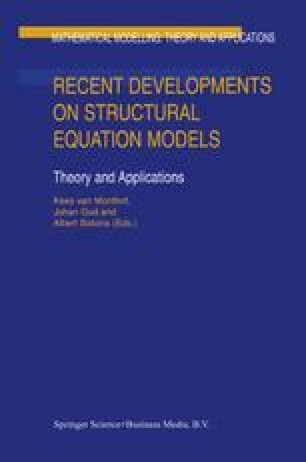 The state space model covers also longitudinal latent factor and path analysis models and allows the optimal estimation of the latent states or factor scores (Oud, van den Bercken & Essers, 1990; Oud, Jansen, van Leeuwe, Aarnoutse, & Voeten, 1999). Latent state estimation is performed by two important results of the state space approach: the Kalman filter and smoother (Kalman, 1960; Rauch, Tung, & Striebel, 1965).